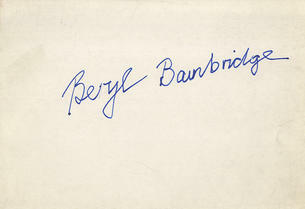 This is a Hand Signed white label 4.5" x 3.25" by the late British author. The label could easily be removed from its backing to stick in a book or on a card. Dame Beryl Margaret Bainbridge, DBE (21 November 1932 - 2 July 2010) was an English author from Liverpool. She was primarily known for her psychological novels, often set amongst the English working classes. Bainbridge won the Whitbread Awards prize for best novel in 1977 and 1996; she was nominated five times for the Booker Prize. She was described in 2007 as "a national treasure". In 2008, The Times newspaper named Bainbridge among their list of "The 50 greatest British writers since 1945".